Conductive: Occurs when there is a problem in the outer or middle ear. Sound waves are not able to pass through the outer and/or middle ear to the inner ear for processing. This can happen if your child has an ear infection or if they have a malformation of the outer or middle ear. Sensorineural: Occurs when the inner ear (cochlea) or the auditory nerve is malformed or has been damaged. It is caused by damage to tiny hairs within the cochlea. Mixed: A combination of conductive and sensorineural hearing loss. Neural: A result of damage to the auditory nerve that connects the cochlea to the brain. Auditory Neuropathy: Sound enters the ear normally, but the transmission from the ear to the brain is impaired. This can lead to distorted speech perception because sound does not consistently travel to the brain. Mild Hearing Loss: Soft noises are not heard. Understanding speech is difficult in a loud environment. Moderate Hearing Loss: Soft and moderately loud noises are not heard. Understanding speech becomes very difficult if background noise is present. Severe Hearing Loss: Conversations have to be conducted loudly. Group conversations are possible only with a lot of effort. Profound Hearing Loss: Some very loud noises are heard. Without a hearing aid, communication is no longer possible even with intense effort. This approach to language development requires that infants and young children with hearing loss are taught to listen and talk with the support of hearing technology, such as hearing aids or cochlear implants. The focus is on development of speech and language through hearing. Parents and caregivers are supported in their role as the child’s most important teacher of language, and the goal is for the child to attend mainstream schools. Cued Speech is not a language and must accompany speech. Cued Speech is a visual communication system that can be used to demonstrate phonetic information for children who may not be able to learn entirely though amplified hearing. Designed to enhance lipreading ability, Cued Speech is used as a tool for speech reading spoken languages and combines the natural mouth movements of speech with eight hand shapes (cues) that represent different sounds of speech. American Sign Language is a manual communication language taught as a child's primary language, with English taught as a second language. This communication option seeks to provide children with knowledge about and acceptance into two cultures – Deaf and hearing. This language does not require the use of spoken words or sounds. American Sign Language uses hand symbols and gestures combined with facial expressions to communicate language. American Sign Language is recognized as a true language in its own right and does not follow the grammatical structure of English. This method is used extensively within the Deaf community, a group that views itself as having a separate culture and identity from mainstream hearing society. Learning to read is very challenging if American Sign Language is chosen as the first language. Total Communication uses a combination of methods to teach a child, including a form of sign language, finger spelling, speech reading, speaking, and amplification. The sign systems used in Total Communication are typically based in English word order and follow English grammatical structure, and do not represent a separate language as with American Sign Language. Hearing aids, FM systems, or cochlear implants are considered important in most total communication programs as children are encouraged to make maximum use of their residual hearing. A hearing aid is a device for the ear, which amplifies or makes sounds louder for a child’s hearing loss. The goal is to provide the ability to hear speech and environmental sounds at a comfortable level. For people with mild to moderate hearing loss, a hearing aid can significantly help communication by amplifying sound. Hearing aids are small electronic, battery-operated devices that collect sounds via a microphone, amplify the sound, and direct signal into the child's ear. Hearing aids come in a wide variety of types and styles. A Behind-The-Ear (BTE) hearing aid is the most appropriate hearing aid for a child because the size of their ear is rapidly changing as they grow. An impression is taken of the ear and is made into an earmold. The earmold attaches to the BTE hearing aid. An audiologist (a health professional that specializes in hearing) can help determine which hearing aid is best for your child. Depending on the amount of hearing loss, hearing aids may be worn in one ear (monaural) or both ears (binaural). A cochlear implant is a device that provides direct electrical stimulation to the auditory (hearing) nerve in the inner ear. Children with severe to profound sensorineural (i.e. damage to tiny hair cells in the cochlea) hearing loss in both ears or auditory neuropathy (impaired transmission of sound from the cochlea to the brain) are candidates for a cochlear implant. Because of this damage or dysfunction in the ear, adequate information about environmental and speech sounds cannot reach the auditory nerve. With a cochlear implant the auditory nerve is stimulated directly. Cochlear implants have external (outside) parts and internal (surgically implanted) parts that work together to allow a child to perceive sound. The external parts include a microphone, a speech processor, and a transmitter. The microphone looks like a Behind-The-Ear hearing aid. It picks up sounds—just like a hearing aid microphone does—and sends them to the speech processor. The speech processor may be housed with the microphone behind the ear, or it may be a small box-like unit typically worn in a chest pocket. The speech processor is a computer that analyzes and digitizes the sound signals and sends them to a transmitter worn on the head just behind the ear. The transmitter sends the coded signals to an implanted receiver just under the skin. The internal (implanted) parts include a receiver and electrodes. The receiver is just under the skin behind the ear. The receiver takes the coded electrical signals from the transmitter and delivers them to the array of electrodes that have been surgically inserted in the cochlea. The electrodes stimulate the auditory nerve fibers and information about the signal (i.e. 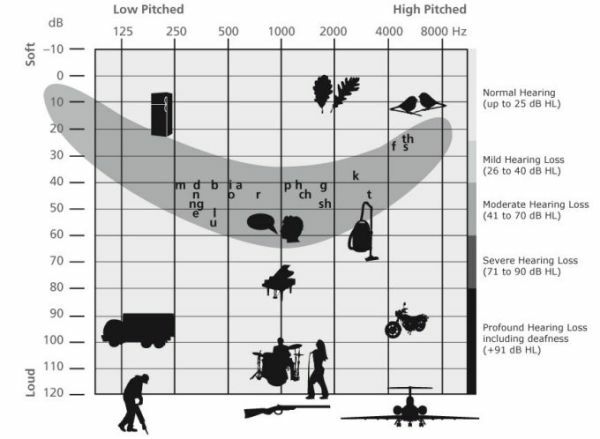 pitch and loudness) are sent to the brain. This results in perception of sound. Where can I go to get a cochlear implant? There are cochlear implant centers around the country. At these centers, teams of professionals work together with patients from start to finish. Team members typically include an audiologist, ENT/surgeon, psychologist, counselor, and speech-language pathologist. The team works with individuals and their families to determine candidacy for an implant, perform the surgery, and provide follow-up care. This follow-up care occurs at the implant center as well as through local agencies or school districts near the patient. Once a person is referred to the cochlear implant center, more testing is done to determine whether the child is a suitable candidate. This testing usually includes audiologic testing, psychological testing, medical examination, and tests performed by the surgeon. The process often involves examination using CT scans and MRI (magnetic resonance imaging), as well as counseling. This is done to ensure that the child will benefit from a cochlear implant and will have the motivation to participate in the process. It is important that the child (if old enough) and parents understand what the cochlear implant will and will not do. Also, it is important to understand the commitment required for care and follow-up services. Once the decision is made to go ahead with a cochlear implant, the surgery is done. Sometimes it involves an overnight stay in the hospital and sometimes it is done on an outpatient basis. Several weeks after surgery, the child returns to the center to be fit with the external parts (i.e. the microphone and speech processor) and to activate and program (called mapping) the cochlear implant. This initial fitting process is completed over several days and may include additional visits over several months. The additional visits are needed for activating, adjusting, and programming the various electrodes that have been implanted. Also, as the child develops skill in using the cochlear implant, adjustments and reprogramming are required. Usually, there are annual visits to the center for checkups once the final programming is made to the speech processor. 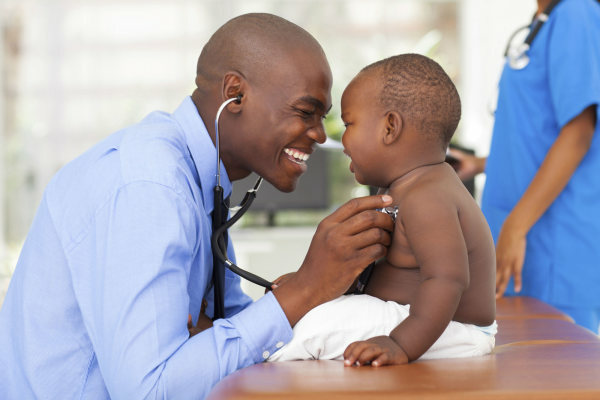 Children receive extensive rehabilitation services from audiologists, speech-language pathologists, teachers, and counselors as they learn to listen and talk. They are taught how to use the cochlear implant and how to respond to the sounds they are receiving. For those who have heard before, sounds through the cochlear implant may seem unnatural at first. Those who have never heard before must be taught what the sounds are. FM technology refers to a type of wireless system that helps people better understand speech in noisy situations. FM systems commonly work together with a child’s hearing aids or cochlear implants. The personal FM system consists of a transmitter microphone used by the speaker (such as the teacher in the classroom or the speaker at a lecture) and a receiver used by the child. The receiver transmits the sound to your child’s ears via the hearing aid or cochlear implant. Personal FM systems are useful in a variety of situations, such as in a classroom, in a restaurant, or playing sports. A BAHA (bone anchored hearing aid) is an implantable hearing device used to treat hearing loss. It also can be worn on a softband for younger children. The device works by directly stimulating the inner ear through the bone. A BAHA is used to improve hearing in patients with chronic ear infections, congenital external auditory canal atresia (when the ear canal does not develop) or one-sided deafness who cannot benefit from regular hearing aids. The system works by taking the sound from the outside and transmitting it to the inner ear through the bone. This bypasses the ear canal and the middle ear. The implant is placed during a minor surgical procedure and over time integrates with the bone behind the ear. The hearing device transmits sound vibrations through the implant to the skull and the inner ear – where the hearing takes place. Listening Matters is a not-for-profit, Section 501(c)(3) corporation.